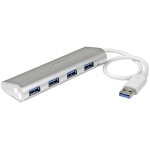 This 4-port portable USB 3.0 hub is tailored to match the stylish design of your MacBook, or laptop with a similar matte silver finish. It features a sleek, silver sandblasted housing that looks great next to your Apple laptop, and because the hub is designed with a solid-aluminum casing, it provides the lightweight durability that’s ideal for either travel or desktop usage. It also integrates a lengthier, 27 cm (10.5 in) cable, so you have the flexibility to place the hub and your devices exactly where you need them. • This high-quality, Apple style USB hub gives you an easy way to expand your MacBook connectivity. 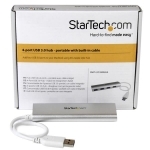 It provides four USB 3.0 (also known as USB 3.1 Gen 1) hub ports in a compact housing. Its silver sandblast finish provides a unique and stylish look when compared to traditional hubs. Now your USB hub can look as trendy and contemporary as your MacBook or Ultrabook, or your laptop that features a similar finish or shade. • The hub’s built-in USB cable has sufficient length to reach your laptop’s USB 3.0 port, regardless of where the port is located. Plus, the extended-length cable provides you with more desk placement options. 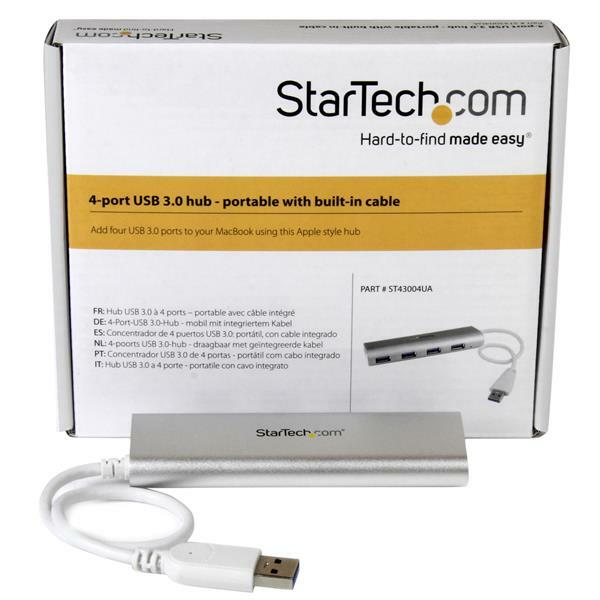 • If you’re looking for portability, then this hub can help. Its compact and lightweight design makes it ideal for travel. Plus, with a built-in USB cable, you can tuck the versatile hub neatly into your travel bag, and avoid the nuisance of carrying around a separate power adapter. • With a rugged aluminum housing, the hub offers dependable protection, so it’s perfect for back-and-forth trips from home to office. Plus, the compact USB hub takes up minimal space on a desk, so you can use it in hot-desk or BYOD (Bring Your Own Device) environments. • his bus-powered hub is plug-and-play and hot-swap compatible, so you can install it quickly, with no additional drivers or software required. It also supports hot plugging, so you can connect and disconnect the hub and your devices while the computer is running. You can also avoid the nuisance and cost of purchasing new devices by using the USB 3.0 hub with your current USB 2.0 and 1.x devices.